We’ve slowly started to reveal the cards in Series 5. What do you think? Just like we said in the last Designers Notes, the new block in Series 5 starts with Shenron Wishes. And that comes with the new Leader Skill called Wish. http://www.dbs-cardgame.com/us-en/strategy/miraculous-revival/design-concept.php So now, let’s go over the design concept for Wish! First, we wanted to make a new theme just like we had with Over Realm in the Over Realm Block. However, just powering up things the way we had in the past would lead to power creep. Also, looking at the current meta, we wanted to enhance things and bring the meta back to a state where all kinds of strategies and decks are viable. 1: We wanted a new effect to make new strategies with. 2: We wanted that effect to change tactics and thought processes up to this point. That’s the conclusion we came to regarding what would be good for a base for the new block. For the “new effect to make new strategies with”, you’re already aware that’s the new “Wish” skill. Starting with Series 1, one of the main characteristics of DBSCG has been the Awaken skill, letting your Leader Cards power up when they are in trouble. Given the current meta, one of the current strategies is to control the timing with which you use your leader’s Awaken skill. In other words, to purposely lower your Life in order to Awaken, turning trouble into an opportunity for victory. That’s how players use Awaken right now. Keeping that in mind, we wanted to change the conditions needed for Wish to flip a Leader Card over. We wanted to stop making it a positive thing to lose Life, but rather make it more advantageous for you to have more Life when you flip your Leader Card over. With that in mind, we created some new strategies. Up until now, most players would prefer to take damage from their opponent’s attacks rather than guard against them. But we believe that going forward, people will start using Combo to protect their Leaders. During the Over Realm Block, people made use of the Over Realm ability, sending cards from their Drop Area to the Warp. With the new Leader Card skill “Wish”, if there are seven cards in the Drop Area with the keyword skill “Dragon Ball”, you can flip your Leader Card over. Also, once flipped over, you need cards with the “Dragon Ball” skill to activate the three different skills your Leader has. In other words, if you make a deck with a Leader Card that has “Wish”, it would be very difficult for you to also use any cards with Over Realm. To make sure there are no misunderstandings, we want to make it clear that we weren’t planning on solely making Awaken decks weaker and making Wish decks stronger. By adding a skill like Wish that is completely different from everything before it, we’re hoping to make a far more diverse meta than before. And we’ve said this before, but in order to have a diverse meta, we have to make sure that there is a good balance of outcomes between each deck type. After looking at data from large-scale tournaments from everywhere in the world, we’ve noticed that aggro decks are currently doing the best. Starting in Series 5, we think that defensive decks will be on the rise, but we also know if there’s too many defensive cards it will make deck-making less interesting. The BCC Battles Vol. 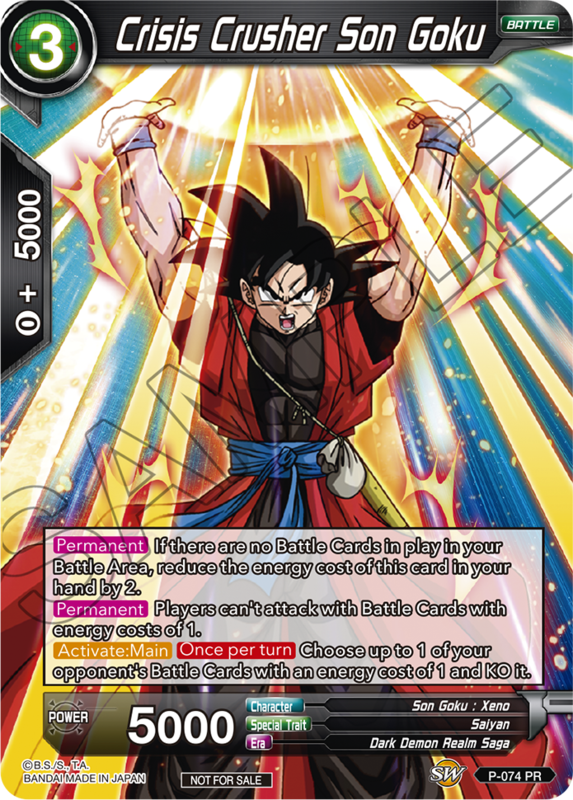 6 card we revealed today, “Crisis Crusher Son Goku”, is an example of the defensive cards we have designed. In DBSCG, decks are made using 50 cards. Deciding which cards to put in your deck is very important but is also one of the more interesting parts of the game. We believe that with the cards in Shenron Wishes, Series 5 and the associated promotional cards coming out in November, all the players out there will be able to enjoy DBSCG even more than before. On that note of allowing players to enjoy DBSCG even more than before, we’re also starting a BCC Player ranking system in November. We’ll release details on it later, but we’re hoping this will increase the desire to play in our competitive players. We’re also designing more cards in hopes to draw in Dragon Ball Fans and card game fans, as well as players who have no card game experience at all. We appreciate all of your warm support and ask that you continue supporting us in the future.